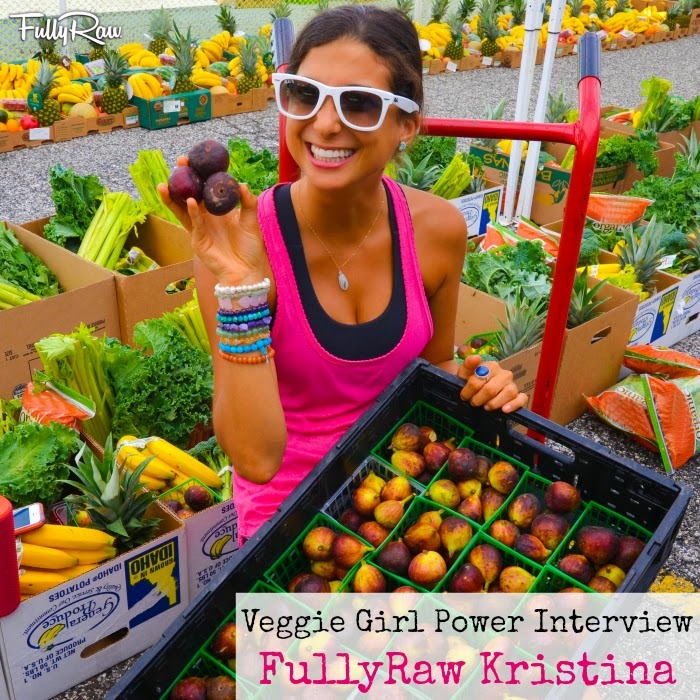 Chatting with FullyRaw Kristina: Veggie Girl Power Interview Series! If you have been following Healthy Happy Life for a while, you probably already know about my Veggie Girl Power Interview Series. In the past I have featured interviews with inspiring veggie voices like Portia de Rossi, Heather Mills, Sarma, Isa, Chloe Coscarelli, Kathy Freston, Marilu Henner and many more. You can catch up and read all my interviews here. Well, the tradition lives on! But instead of posting a bunch of interviews at once this year, I decided to simply make my VGP series more of an ongoing feature here on HHL and post interviews sporadicly. And I have changed up the questions a bit too. So I am very excited to share today's interview with you! Kristina Carrillo-Bucaram of FullyRaw.com! I first discovered Kristina on Instagram and quickly became a fan of her sunny personality, passion for fruits and veggies, fun videos, creative and colorful recipes and tips and photos. Get to know this talented and joyful veggie superstar in today's interview..
Who is She: Kristina is all about living healthfully via living a FullyRaw Lifestyle, or eating a diet consisting primarily of raw, organic, fruits, vegetables, nuts, and seeds. Q1. Your Journey. When and why did you go vegan? Q2. Your Work. What projects are you working on now? What can we expect from you in the future if all your dreams come true? Kristina: I currently have 3 business that are independent, yet they work as one. Rawfully Organic is our community organic produce co-operative that aims to feed families weekly with a box of fruits and veggies. We use our produce from Rawfully Organic to make FullyRaw Juices, which we bottle and sell at co-op as well to other stores in the Houston area. I continue to make YouTube videos, sharing my experiences, recipes, tips, and tricks with my friends and followers. I am also working on a book that will be out in 2016. I feel that I am learning and sharing new things everyday, and I am happy to share a part of my life with you! Q3. Some Fun. Create a dream dinner party guest list. Who inspires you? Name 2-5 people that you would love to chat with for an evening. Where would you go, who would they be and what would you talk about? Kristina: If I were to throw a dinner party and if I could invite 2-5 people who truly inspire me I would invite Oprah, Beyonce, Brené Brown, Tom Hanks, and Doris Day. Q4. Your Food. Describe your day of vegan food, what does one typical-yet-delicious workday look like? Lunch: Bowl of fruit like persimmons (6 or 7), figs, peaches, bananas, or any other fruit in season. Either this or a green smoothie with something like mangos and kale. Dinner: Appetizer of fruit (usually something juicy) followed by a huge rainbow salad with as many colors as I can find in my fridge. I make my own dressings, and my favorite at the moment is my hot pink salad dressing made of orange juice, sesame seeds, cherry tomatoes, basil, rosemary, and a small slice of beet. Kristina: I LOVE 100% pure makeup products. They are fruit based and cruelty free. Q6. Share it. Give us a link to one of your favorite pieces of work. (recipe, video, product, photo, article..) Give us the inside scoop on how you managed to think of this brilliant idea and why you love it. Kristina: One of my favorite recipes is my FullyRaw Carrot Cake (video below) that I made for my birthday. It's the perfect cake to share with family and friends. When I was little, I used to LOVE carrot cake, but since going raw, I had never found a recipe that tasted like anything I knew growing up. So, I created my own little masterpiece. This cake is super sweet with the perfect consistency of ooey, gooey, light, fluffy, and creamy. Q7. Soap Box it. Any last words you want to rant about, we are all ears. Kristina: People think that eating FullyRaw, vegan, or even vegetarian is too difficult or too extreme. I think that not paying attention to one's health and eating junk foods is extreme. Eating FullyRaw is as easy as peeling a banana or biting into a persimmon. Fruit is REAL FAST FOOD. It's simple and delicious. People tell me it can't be done, I live as an example. Where there is a WILL, there is a WAY. Health and happiness are choice. What will yours be?